The husband and I are back from the most amazing, month long trip to Italy. We spent 2 weeks in Rome, 1 week in Montepluciano, and 1 week at the Aeolian Islands (a small set of islands off the coast of Sicily – right on the Mediterranean). The weather was gorgeous, the food was delicious, and I have so many stories and photos to share with all of you! We arrived in Rome at the beginning of July, and rather than staying in a hotel we opted for an apartment in the heart of the city. We stayed on a small side street about 1 block away from the Trevi Fountain, and a 5 minute walk from the Spanish Steps. It was a great location because basically everything in the city was walking distance – nothing was over a mile away! 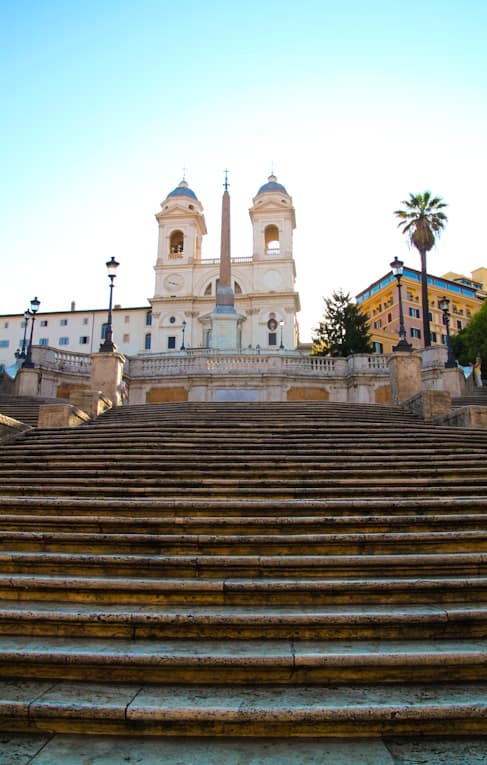 The first night we arrived, we were exhausted and ventured out to the Spanish Steps, picked up some groceries, and stopped by a restaurant for dinner. 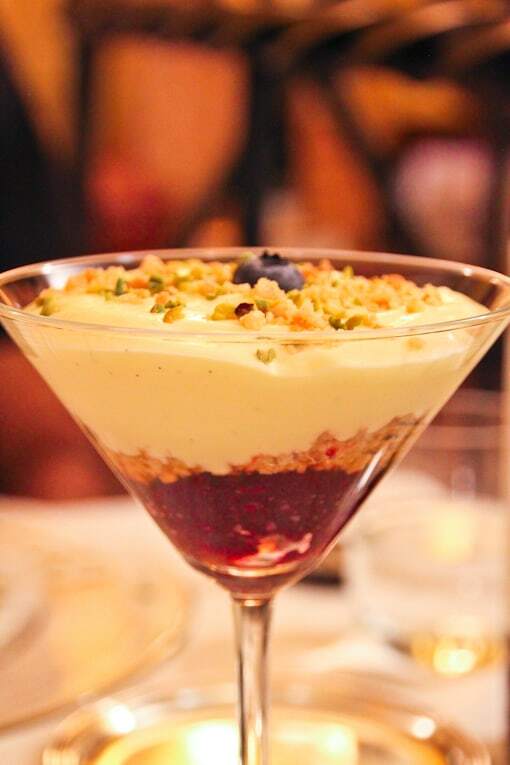 We went to Il Margutta, an all-vegetarian, organic Italian restaurant whose menu changes seasonally. The concept was great, and the food was ok (but not spectacular). We had: zucchini parmesan (pretty good), seitan with baked potato (the seitan was not good but the baked potato was amazing – filled with fresh herbs), and fresh homemade ravioli stuffed with ricotta and served with stewed eggplant, tomatoes and olives, with fresh buratta on the side (the best dish of the night!). The last dish we had was a chilled carrot soup served with black rice, chilled asparagus and potatoes. It was a strange combination, not that seasoned, but was light and healthy which was much needed after our long flight. The next day, we woke up bright and early (thank you jetlag!) and decided to do our own “walking tour” of Rome. 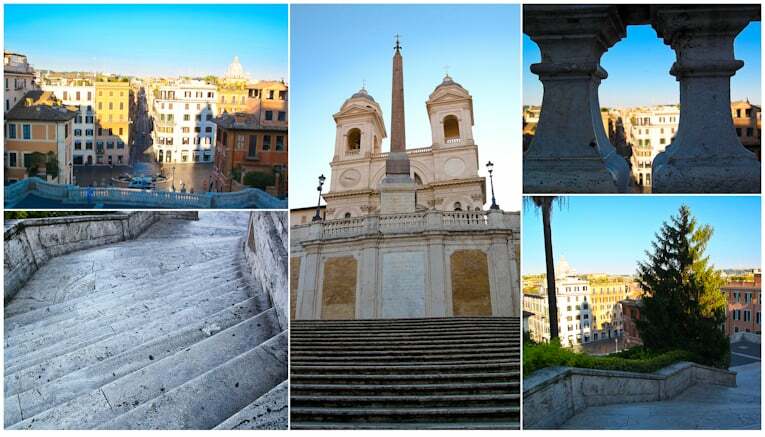 We hit all the main sights: the Spanish Steps (which at 7am was totally deserted and gorgeous), Trevi Fountain, the Parliment, the Pantheon, Piazza Navona, Campo de Fiori (which has one of the best Roman bakeries and a wonderful daily market with fresh fruits, veggies, olive oils, pastas, etc. 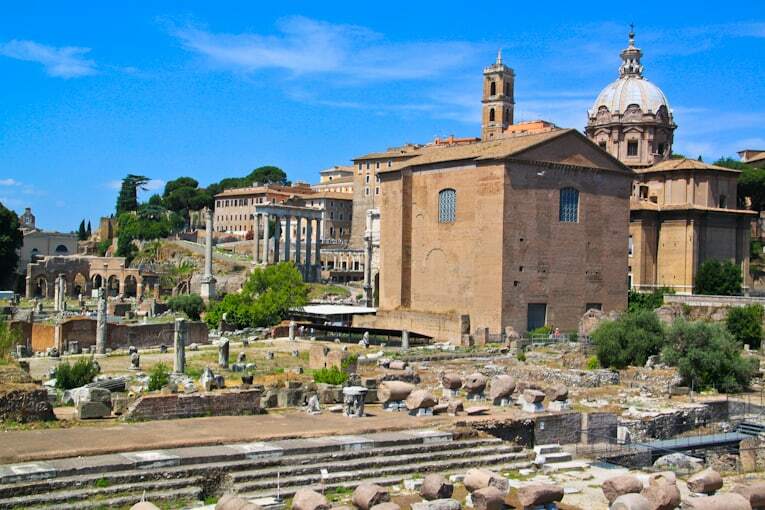 ), the ruins at Largo Di Torre Argentina, and Piazza Venezia. 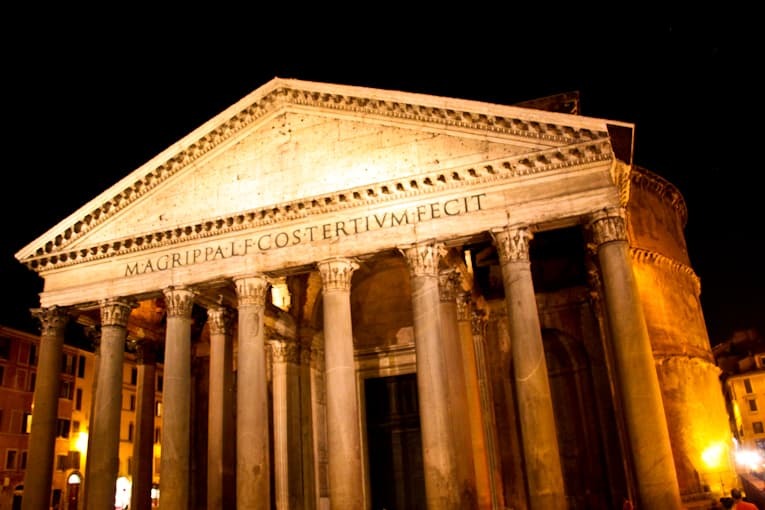 I just couldn’t believe how much history there is in Rome – it truly is an ancient city. 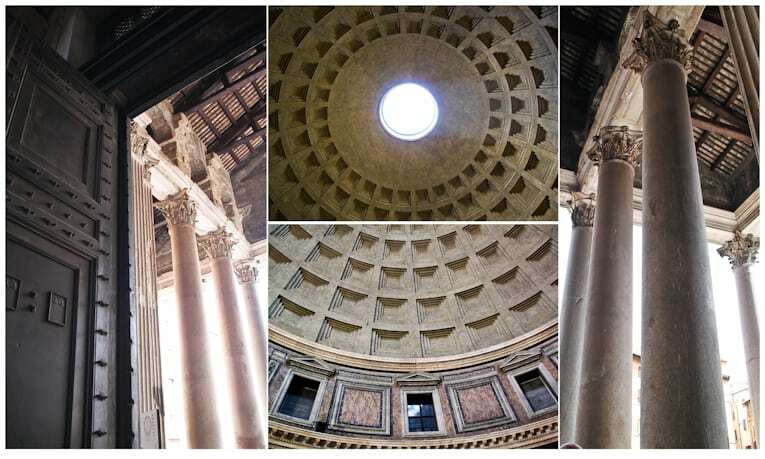 I had never been inside the Pantheon before and it took my breath away. 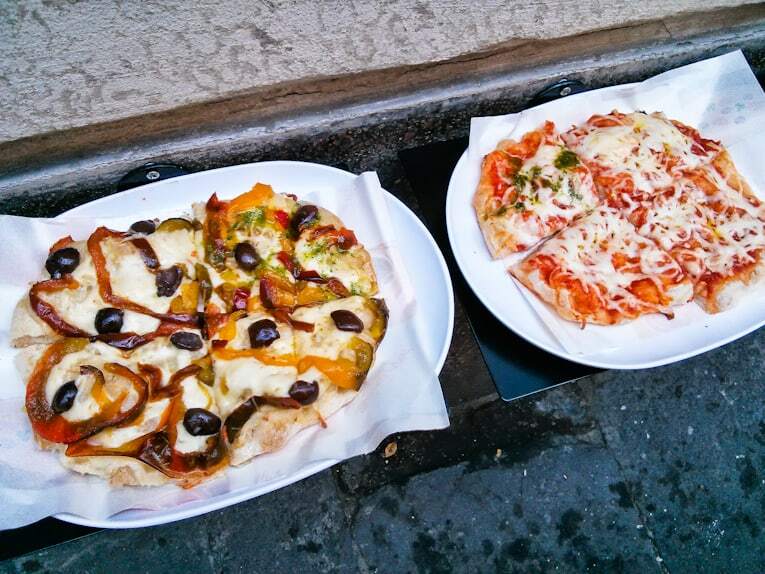 We also stopped by the Obika Mozzarella Bar in Campo de Fiori, which had the most fresh, delicious Italian food – and awesome pizzas. 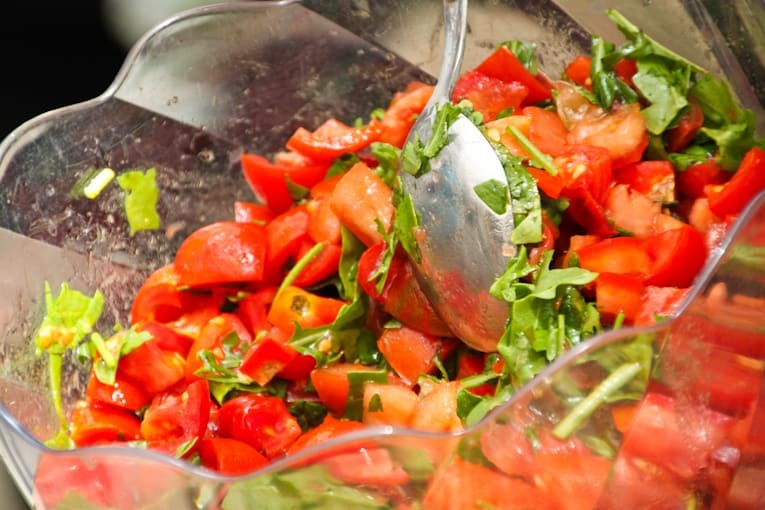 I had the Melone, Rucola e Pecorino – a Mixed Salad with Melon, Datterini Tomatoes, Arugula, Fresh Olives, and Pecorino Romano. The husband had: Verdure di Stagione – A pizza with Grilled Eggplant and Zucchini, Roasted Tomatoes, Mozzarella di Bufala Campana, and chopped Parsley – served on a cornmeal crust! 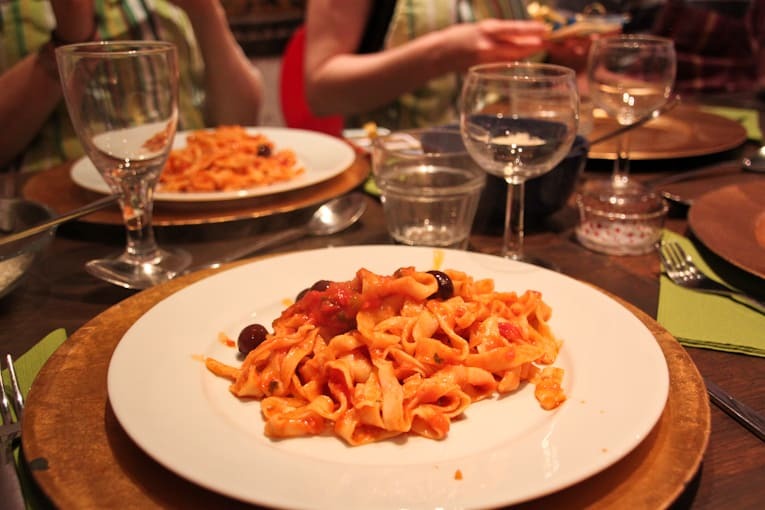 A lot of our time in Rome was spent exploring the various neighborhoods and going on self-made “walking tours” or “food tours.” But we did opt for one organized food tour, run by Eating Italy Food Tours. 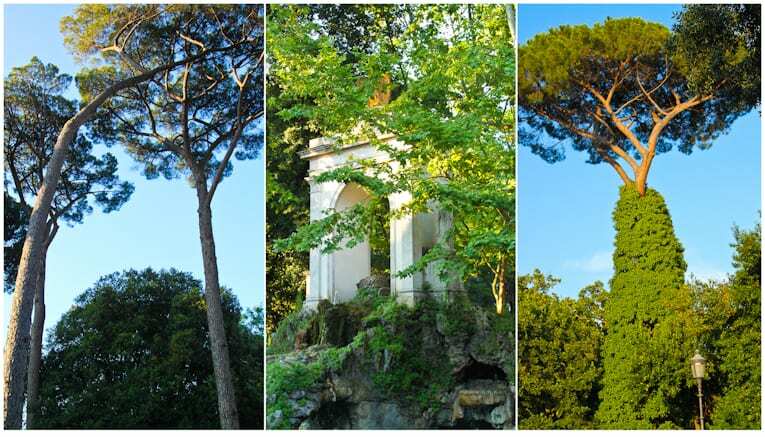 We decided to do their Testaccio tour because it was a neighborhood we hadn’t heard of before and we were curious – and it turned out to be one of the best experiences we had in Rome! Our tour guide was Sarah – an ex-pat from the US who had lived in Rome for 10 years. 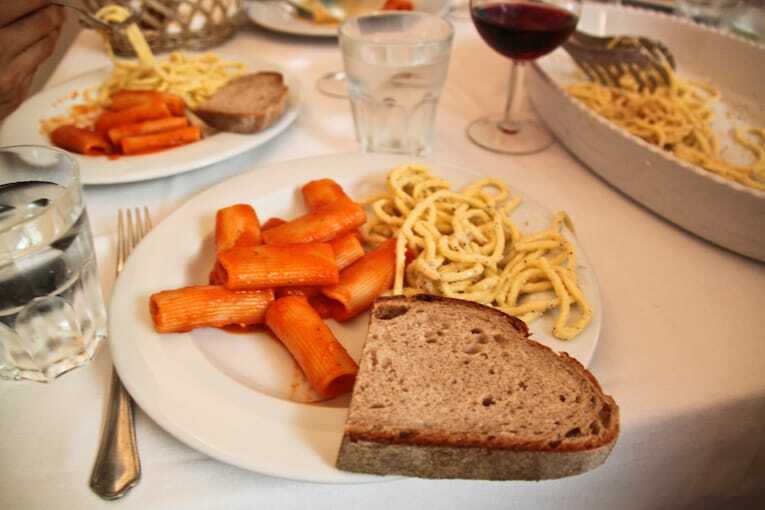 From her, we learned that Testaccio is actually the food capital of Rome – because historically it was where all the food from the port came and all the merchants/etc. set up their shops – many of which are still around today. It’s a 100% non-touristy area. 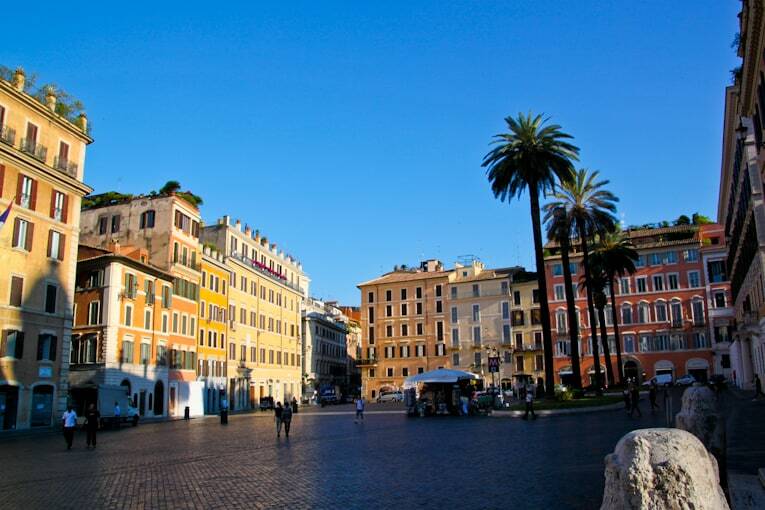 You don’t hear English being spoken, you never see menus like “10 euros – pizza, pasta, salad,” and the streets are much quieter than say – those around the Trevi Fountain. The shops here are authentic, the owners are passionate about their food, and nearly everything is homemade and local. 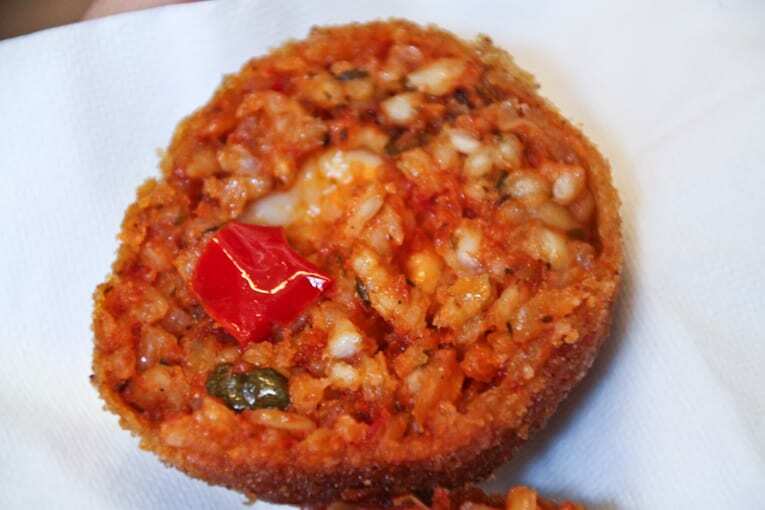 Here is the list of places and wondrous bites we had in Testaccio. 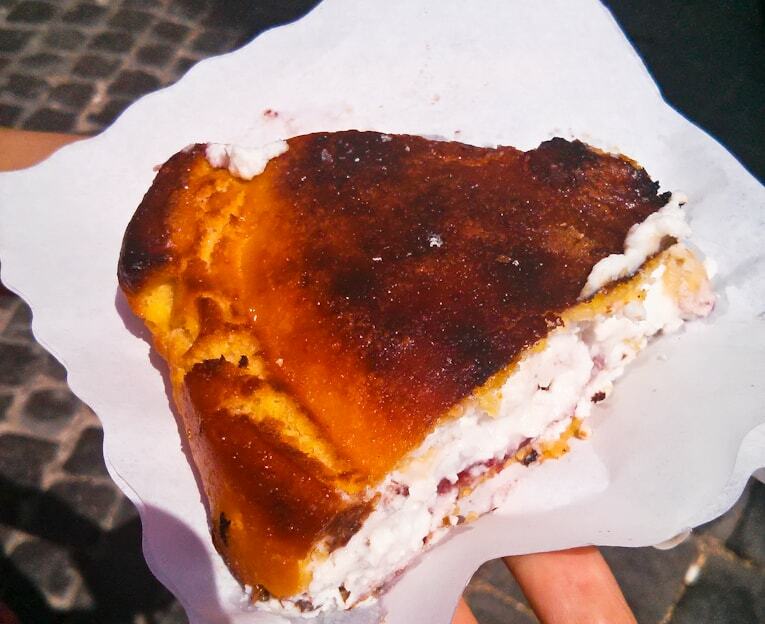 Barberini, Via Marmorata 41 – by far the BEST bakery in all of Rome. 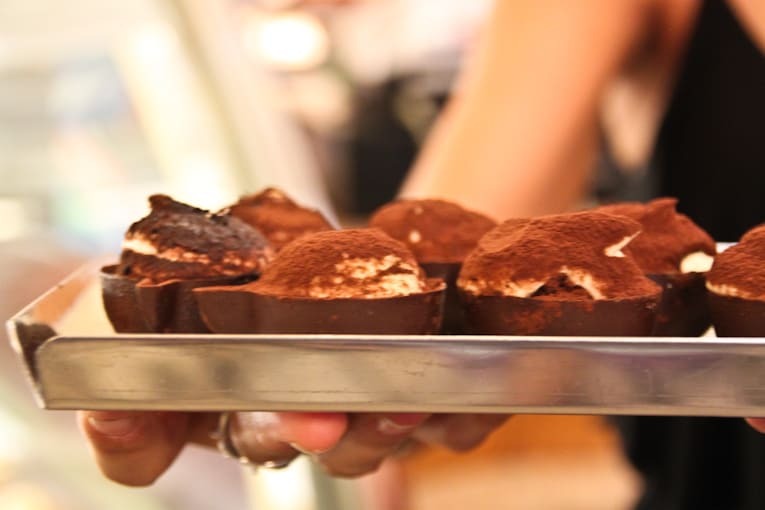 We had the tiramisu bites – served in mini dark chocolate tea cups (to die for), and cornetti – often dipped in a cappuccino for breakfast by Romans. 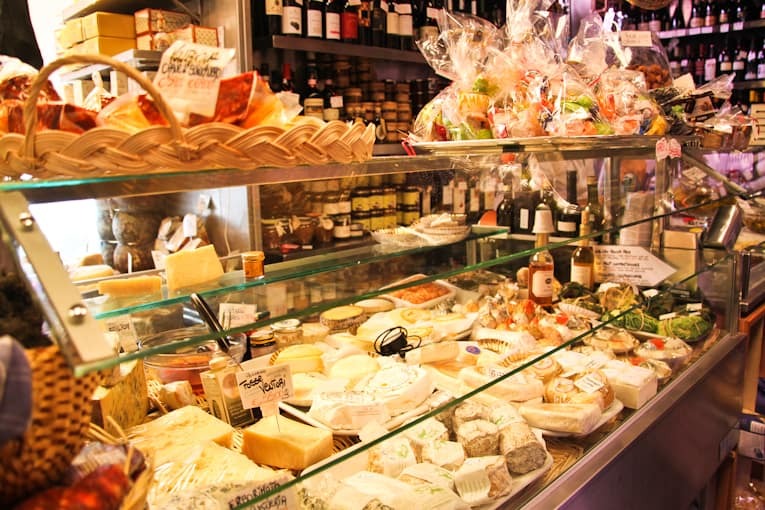 Next we stopped by Volpetti, Via Marmorata 47 – probably the best cheese / olive oil / meats shop you will find in Rome. The people that work there are super nice and knowledgable about their products. They will let you try a bunch of stuff until you find what you’re looking for. We got a little tasting plate of pecorino, parmigiano-reggiano, cured olives, and dried figs. 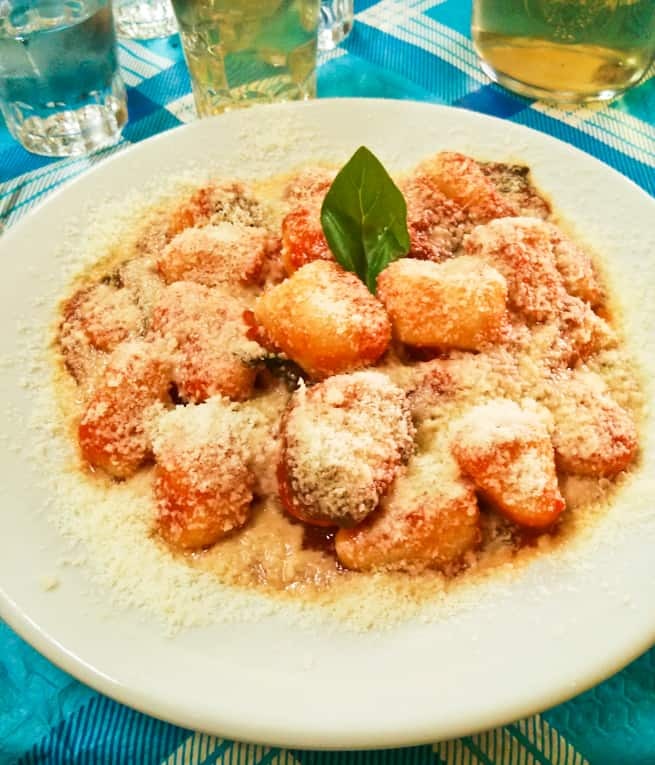 Note: “real” parmesan cheese can only be called “Parmigiano-Reggiano” – because those are the regions (Parma and Reggio) where the cheese is produced. It’s like how “real” champagne can only come from France – same deal here! Next was pizza margherita at Volpetti Piu, Via Alessandro Volta 8. 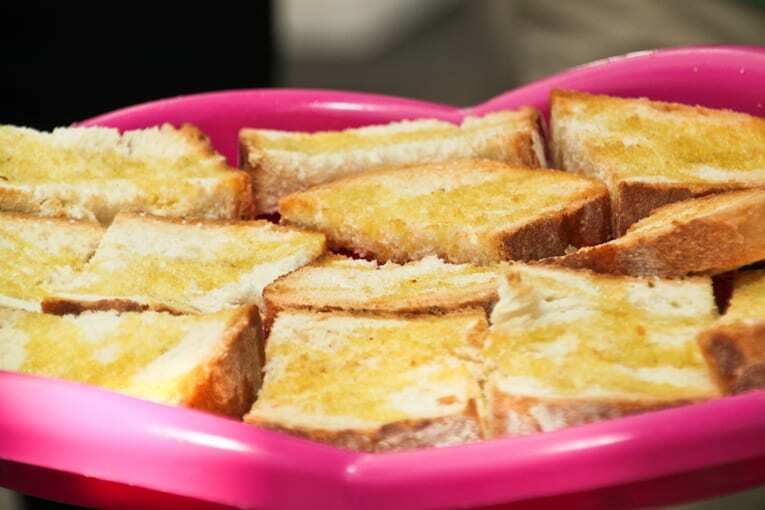 Served hot out of the oven, cheesy, with the perfect crispy crust. 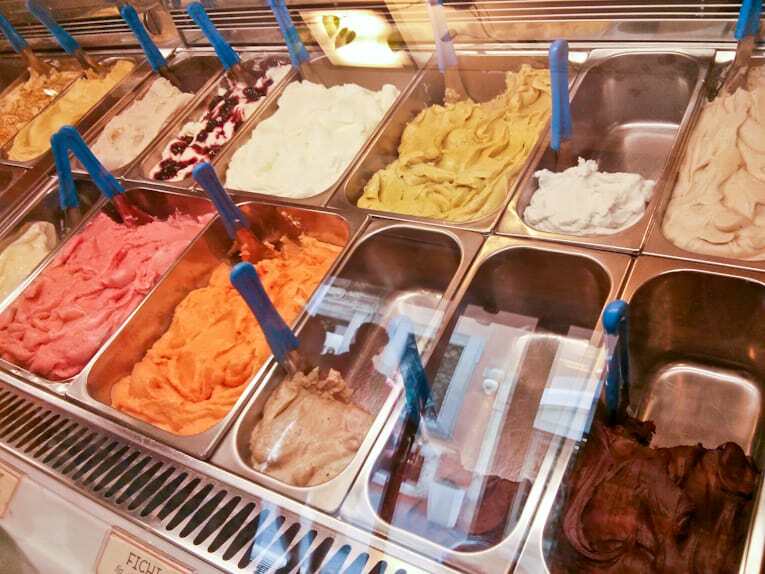 Gelato: 85% of the gelato in Rome is “fake” – which means that it’s not actually made from all-natural ingredients. It’s made from a powdered mix, which is blended with milk, pumped full of oxygen, and with coloring added to it. 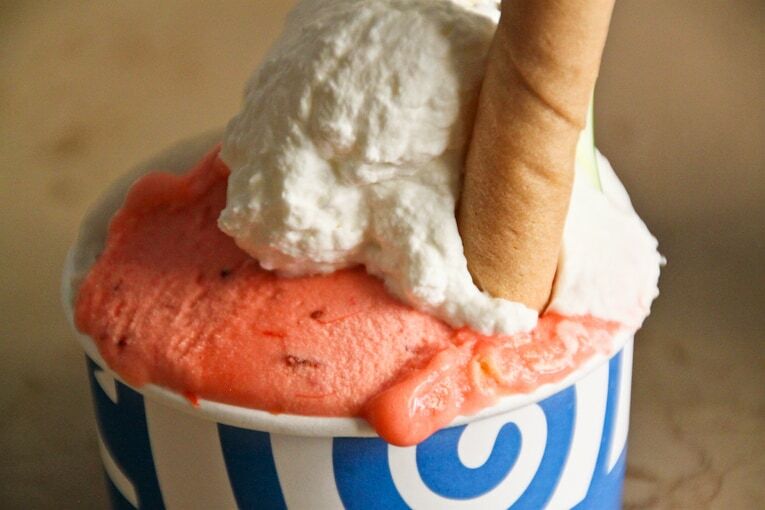 It tastes much sweeter and has a fluffy texture – like whipped ice cream – compared to “real” gelato. 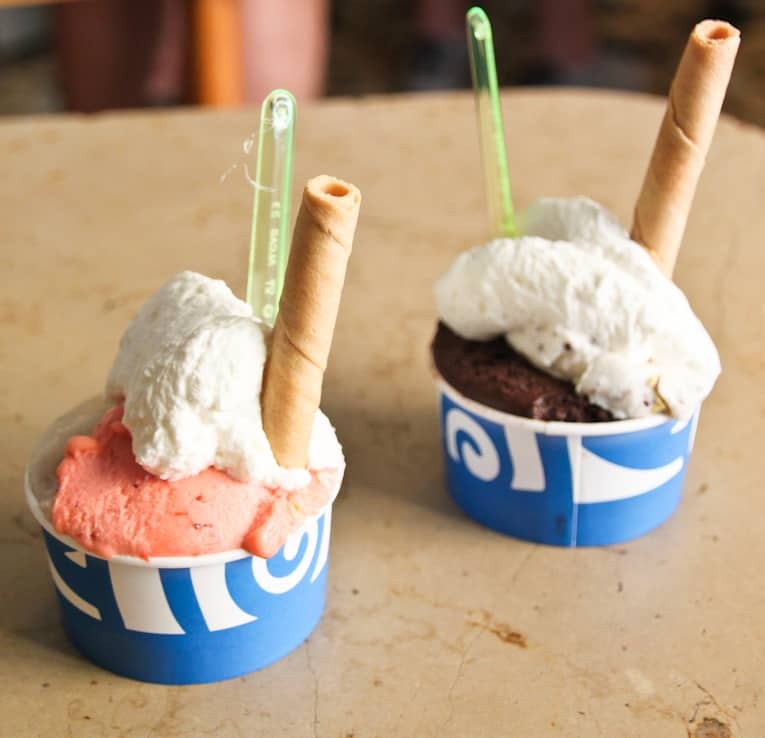 Most of the fake gelato can be found in the more touristy areas. 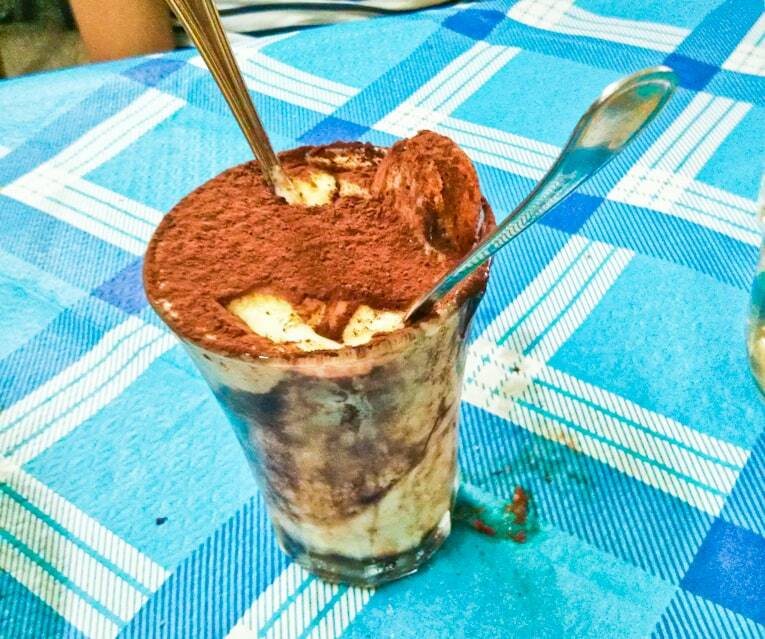 The real gelato is the good stuff – once you have it you can never go back. It’s made with milk and real fruit or real dark chocolate. It doesn’t usually have more than 4-5 ingredients. 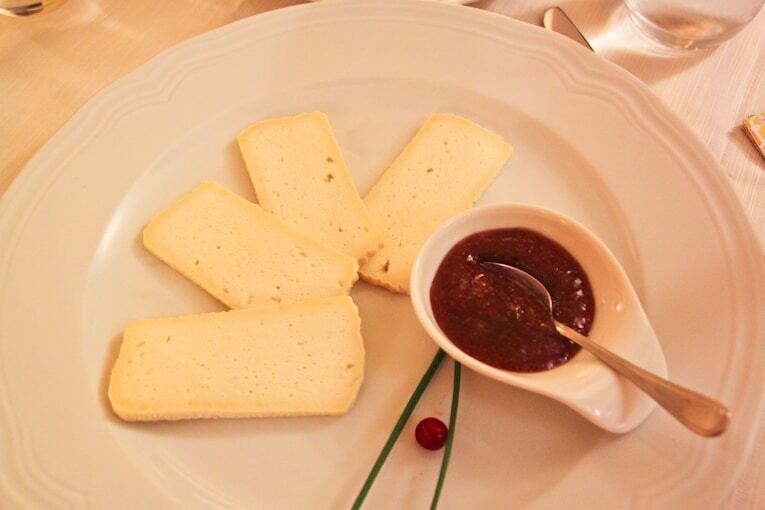 It is thick and creamy – super dense. 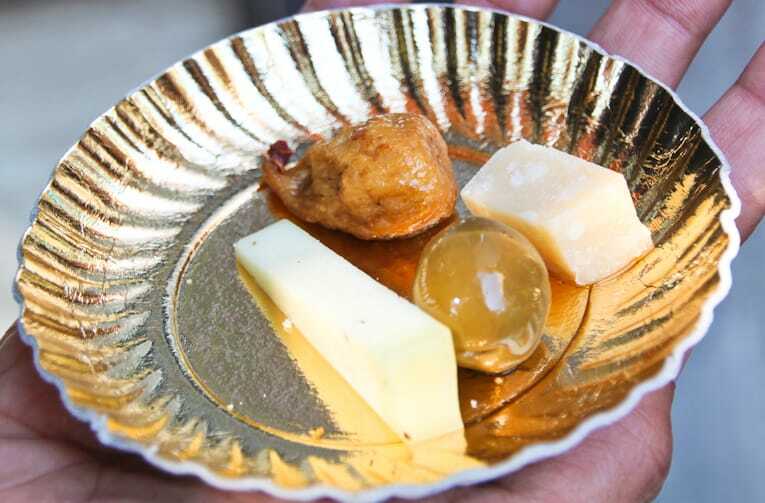 And the punch of flavor in each bite goes a long way. 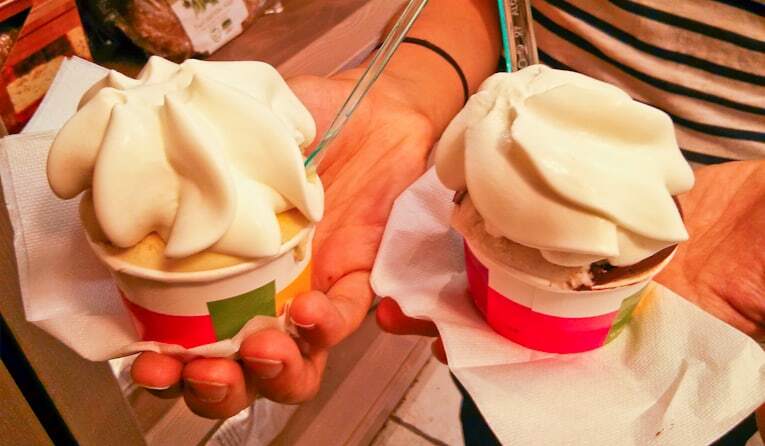 Real gelato is often served with the option of “panna” – fresh, homemade whipped cream. Always, always get the panna. It will be the most amazing whipped cream you have ever tasted. 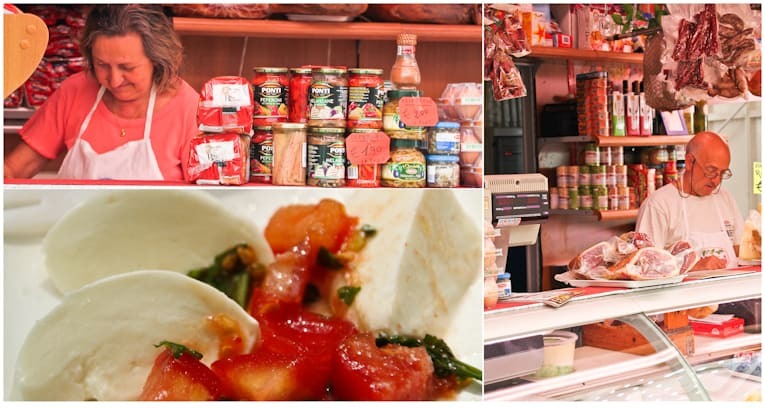 Our next stop was the Testaccio Market – a semi-open-air market with probably the best produce, cheeses, meats, etc. 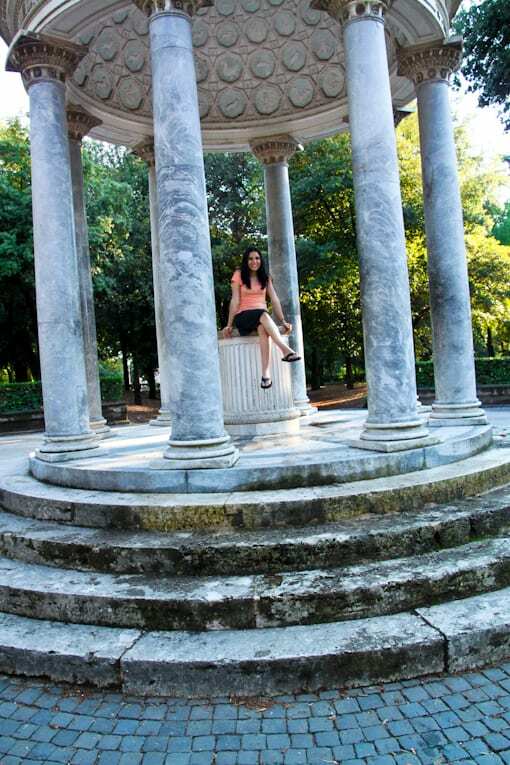 that you will find in Rome. 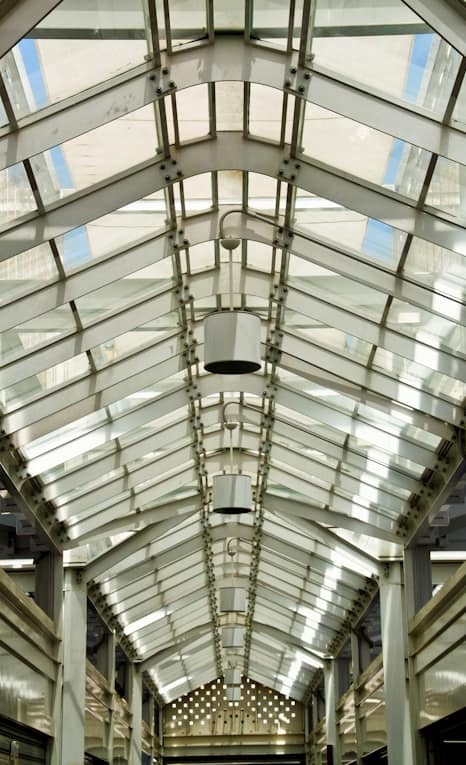 The architecture of the market is interesting – even though it’s partly closed, the greenhouse-type ceiling gives it a very open feel. 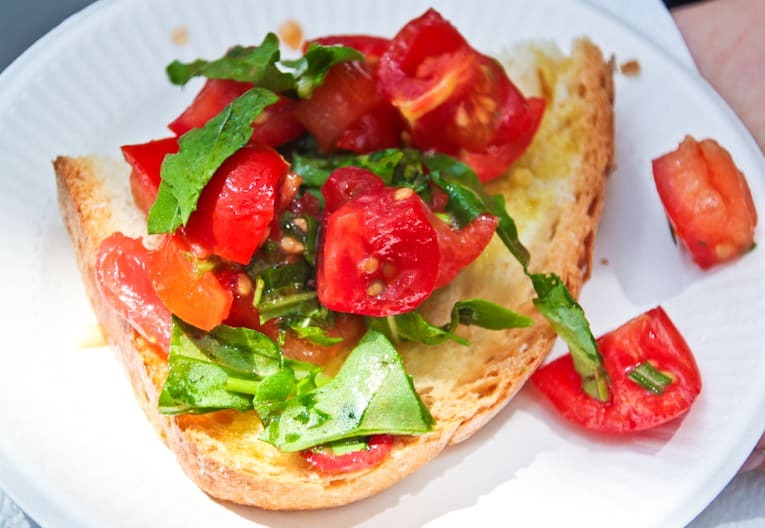 We started our eating with bruschetta on fresh, homemade, warm bread. Then we tasted fresh buffalo mozzarella made that morning from a shop run by the most adorable couple – married 50 years and working together for almost that long. Best fresh mozzarella I have ever had. Last was the cannolis. Which, as I also learned, should always be made in front of you. 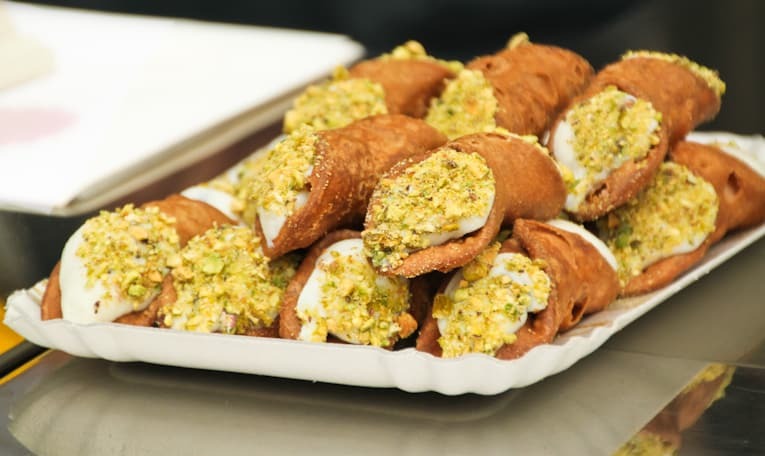 Cannolis should never be pre-filled because then the crust (which should be made fresh that day) becomes soggy. The perfect cannoli is one that is filled with the creamy ricotta as you watch. 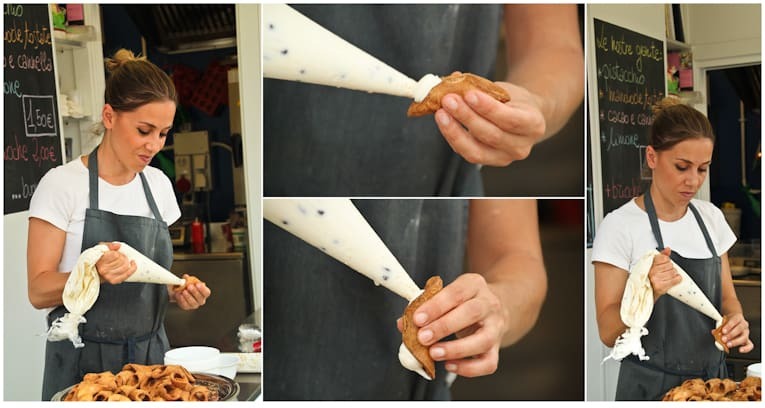 And these were, the absolute perfect cannolis. For the next 4 weeks in Italy, we couldn’t find a better one! Needless to say, we were very full when we ended our tour! But it was so, so, worth it. 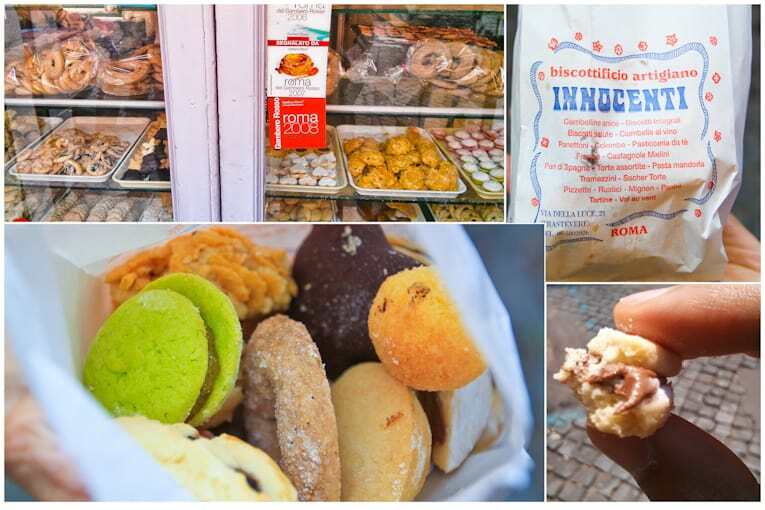 We actually came back to the Testaccio neighborhood towards the end of our time in Rome just to relive some of these delicious treats, and to find some new authentic Italian shops to eat at. 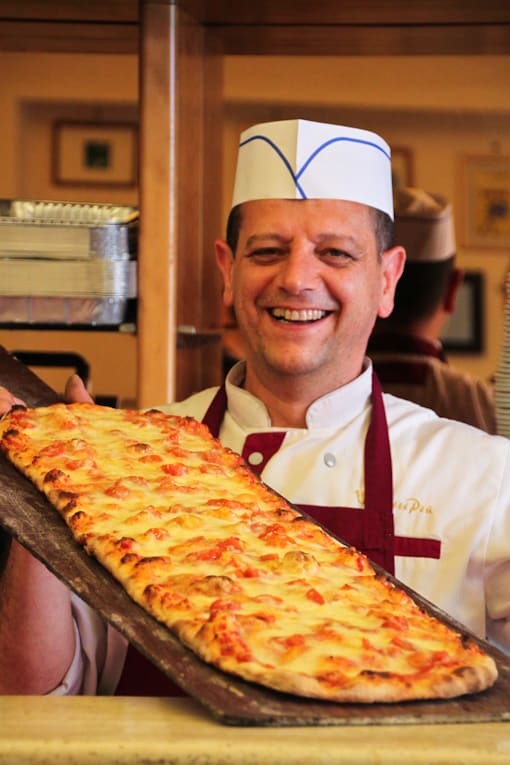 Now, I must talk about the best pizza in Rome. 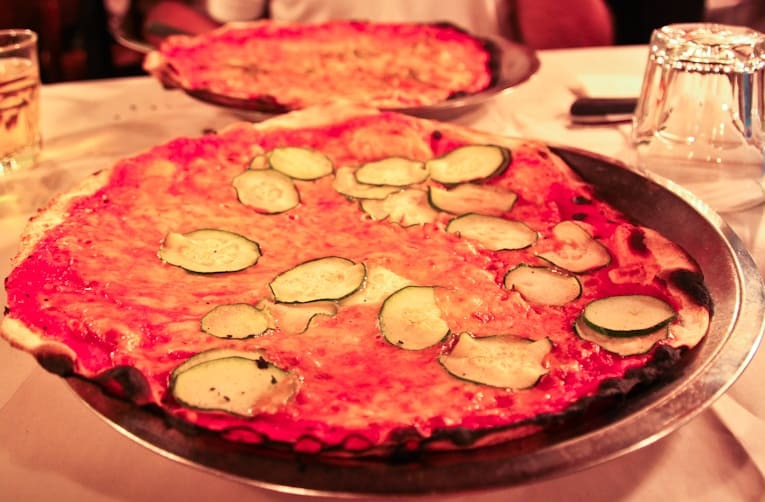 It’s the epitome of real, classic Roman pizza. 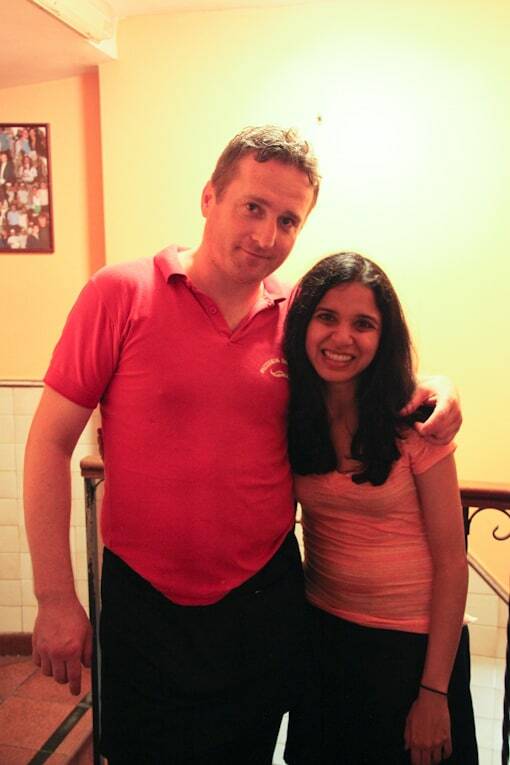 Pizzeria Da Baffetto (Via del Governo Vecchio 114, Piazza Navona) makes the best pizza I have had in my life. The husband, a pizza junkie (he prefers connoisseur) agrees. The crust is made fresh and is ultra ultra thin. 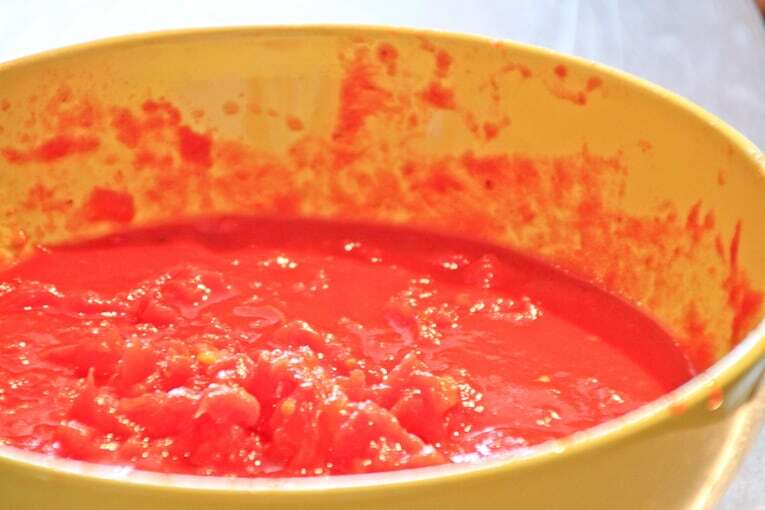 It literally melts in your mouth as you eat it, with the flavors of the fresh tomato sauce and mozzarella melting right along with it. It’s addicting and almost difficult to stop eating it. A few quirks about Baffetto’s: you don’t come here for the service. This place is SO busy (there is always a line to get seated) that the servers have two jobs: take your order and bring you your pizza. The servers are surly and there are no niceties. They don’t make modifications, they don’t coddle you, and you must order at least one pizza per person – house rules. (The husband and I figured this is because each personal pizza is so cheap that they need to sell one per seat to keep their margins up). The decor inside reminded me a bit of a New York pizzeria. It’s chaotic in the greatest way, and if you come after 7:30pm you will be waiting at least 30-45 minutes for your pizza (that’s after you wait to get seated). 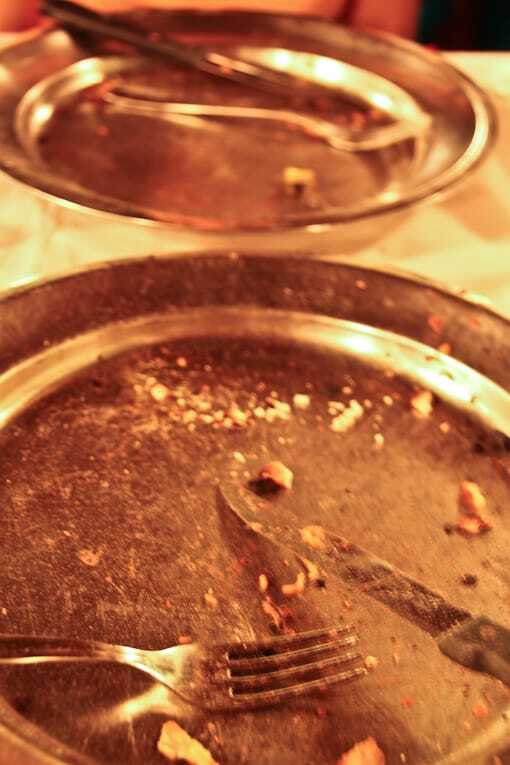 But all of that: the wait, the bare-bones service – it doesn’t matter once you get your pizza and bite into it. All that matters at that point is how amazing the pizza is, and how it’s nothing like you have ever tasted in your life. The pizzas are huge though, and so I couldn’t finish mine … but the husband took care of that for me. Our grumpy waiter who (as other customers told us) never, ever smiles – gave the husband a high five for that. We also managed to charm him enough to get a picture with him. It was a unique experience for sure! Bafetto’s was another place we revisited later on in our trip. Another restaurant we visited over and over (4 times to be exact) was Ristorante Life. It’s in a touristy area, but the food is undeniably authentic and incredibly well made. 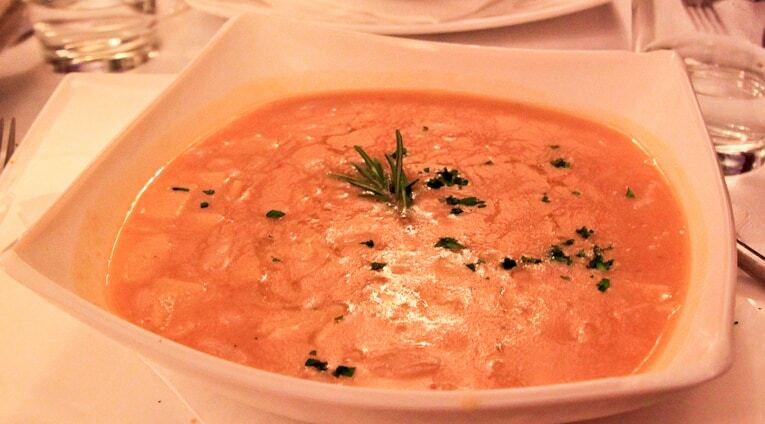 They have the best soups I had in Rome – the Minestrone, the Tomato Soup and the Pasta e Fagioli were all vegetarian-friendly, hearty, healthy, with layers of flavor, and perfectly seasoned. Their pizzas and pastas were all made in-house. The husband and I loved the fresh ravioli filled with ricotta and served with a fresh tomato/eggplant sauce, as well as their pizza with crushed red pepper and onions. The pizza was the second best (after Baffetto’s) we had in Italy. They have a range of desserts, all of which were pretty good. 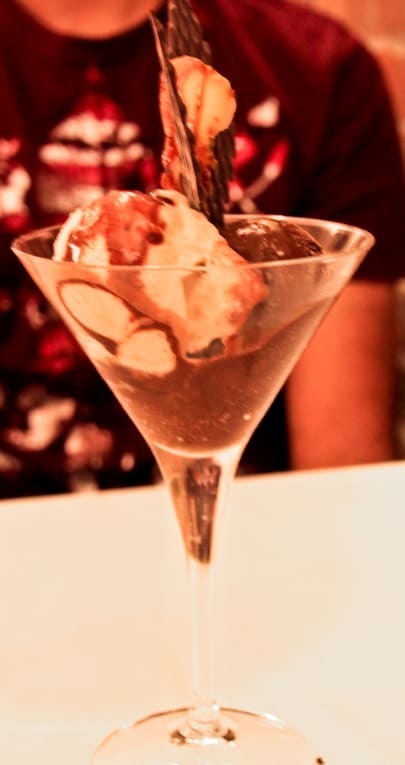 The last dessert we ordered was a gelato “sundae” – enough said. 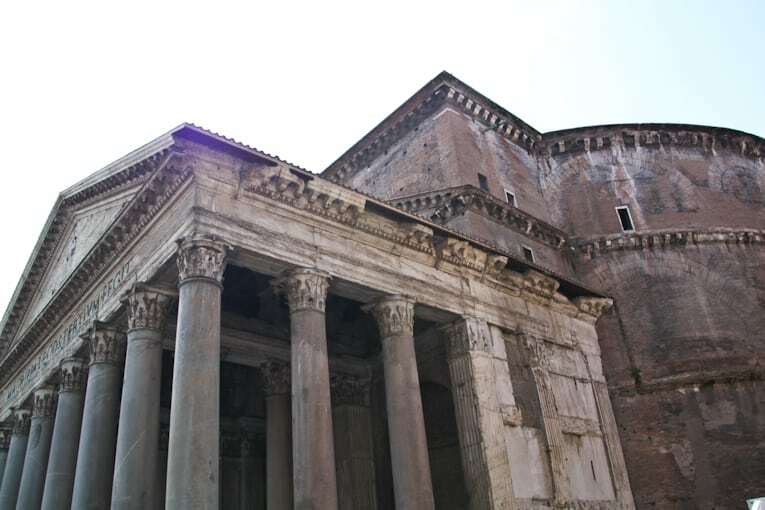 …And the ruins / historic buildings at The Roman Forum and Piazza Venezia. 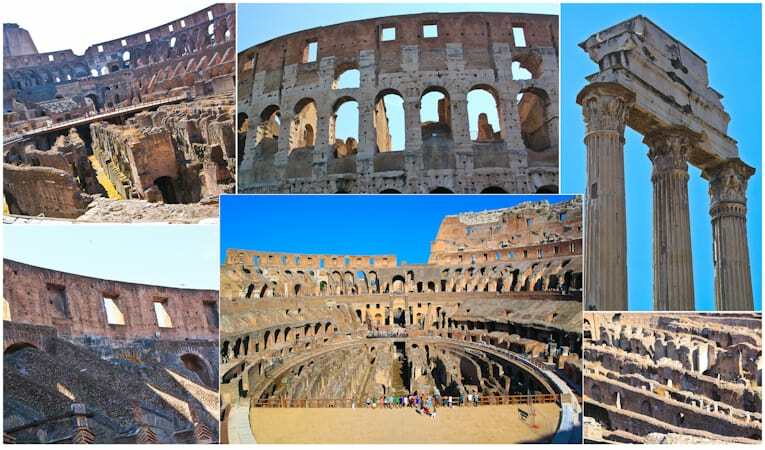 We spent hours and hours walking around the Colosseum and Roman Forum, and I was actually surprised at how intact a lot of these ruins still were. 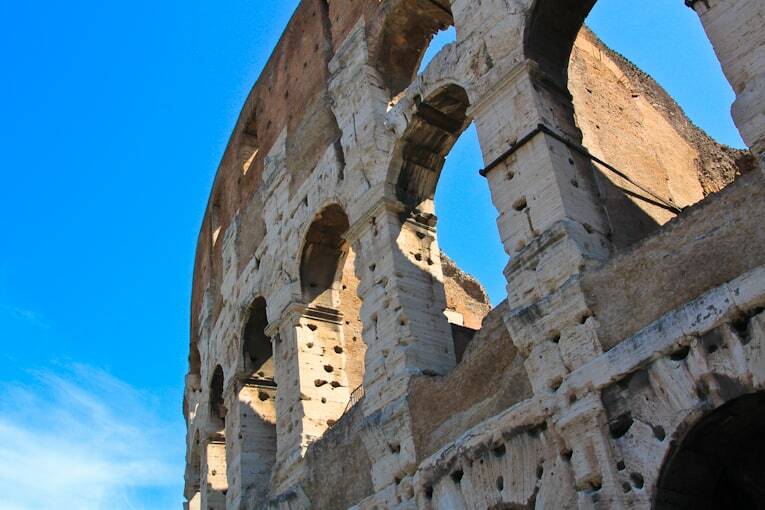 The Colosseum is truly a sight to see, beautiful architecture and fascinating history. 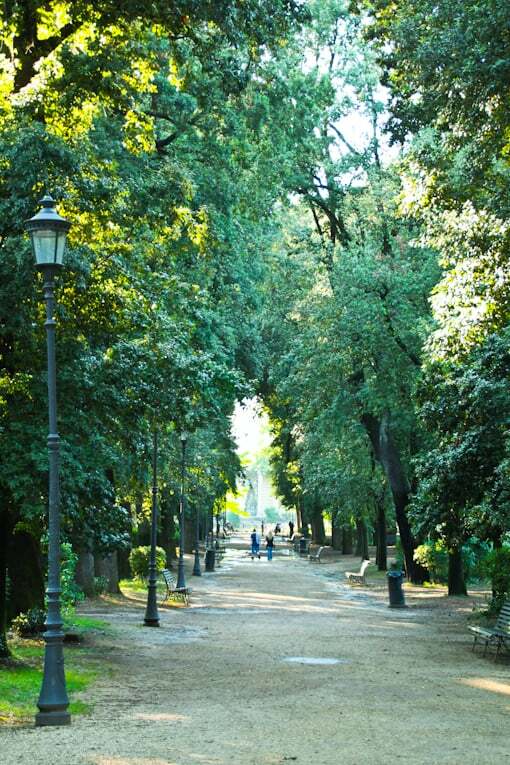 Rome also has some great parks, and by far our favorite was Villa Borghese. This park is enormous – perfect for running, for an evening stroll, or even for watching an outdoor movie (they play them weekly in the summer). 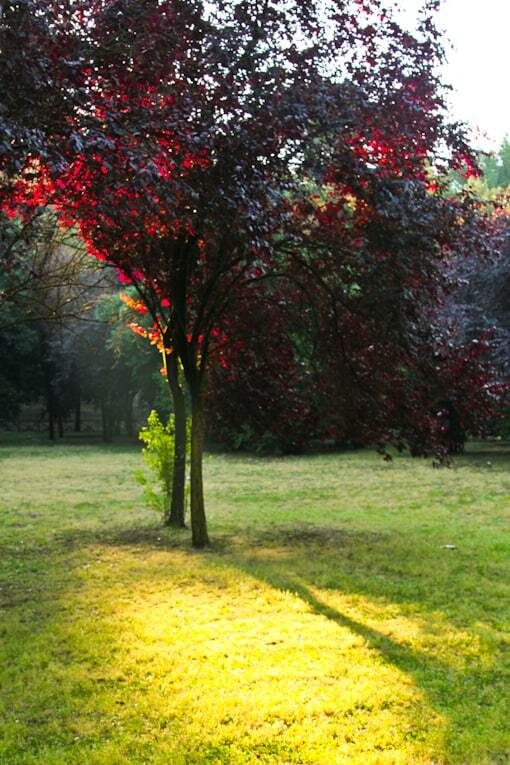 It had the coolest trees – between their shape and color I couldn’t get enough. 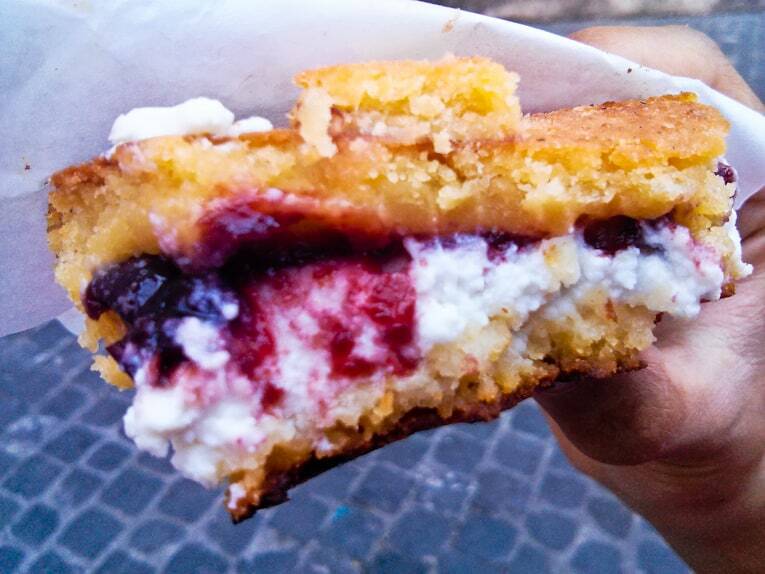 We continued our exploring in Trastevere – another foodie neighborhood right next to the Tiber river. It’s less touristy than the city center, but slightly more touristy than Testaccio. 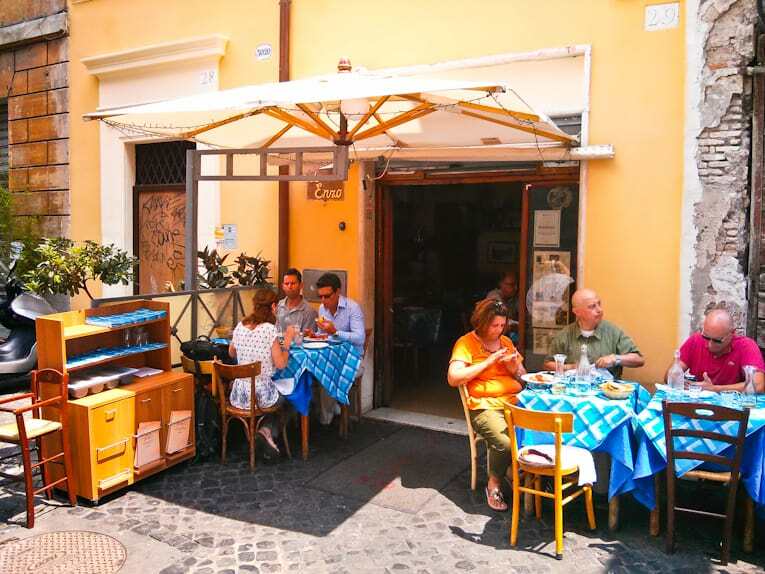 But you are guaranteed to find a great meal in Trastevere. We started at Biscottificio Artigiano Innocenti, Via delle Luce 21 – a bakery with a selection of 70 types of cookies made fresh daily out of an 8 foot oven. We got one of every cookie – and took a bunch back to our apartment. Their cookies were awesome – not too sweet and perfectly portioned. After our dessert, we had lunch (yes, totally in the right order). We went to Da Enzo Al 29, Via dei Vascellari, 29. This place felt like a true trattoria. 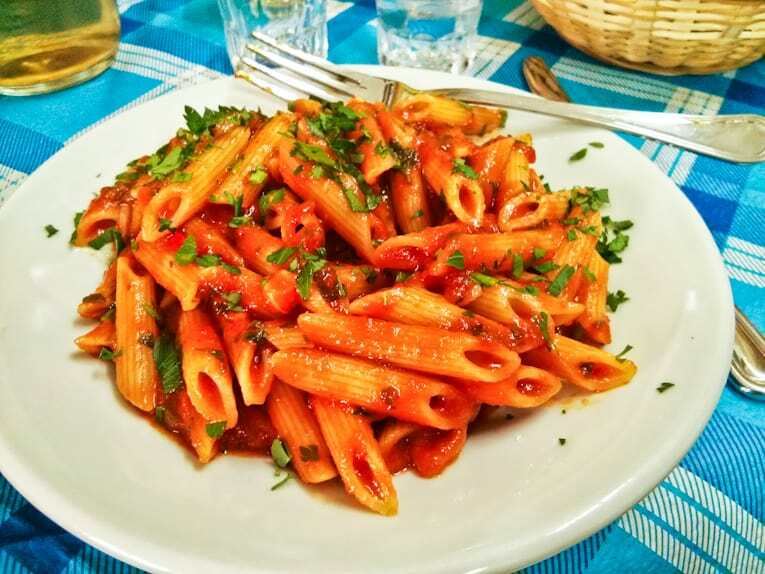 We had the Penne Aribiatta (which really wasn’t spicy at all – more like a Pomodoro – but still tasty). The husband got the Gnocchi in Tomato Sauce with Parmesan. The gnocchi was ok, the sauce was great. I also got peppers and eggplant marinated in olive oil. Tons of oil, but the veggies were flavorful (served cold like antipasto). For dessert we tried the tiramisu – the custard in it was really tasty. 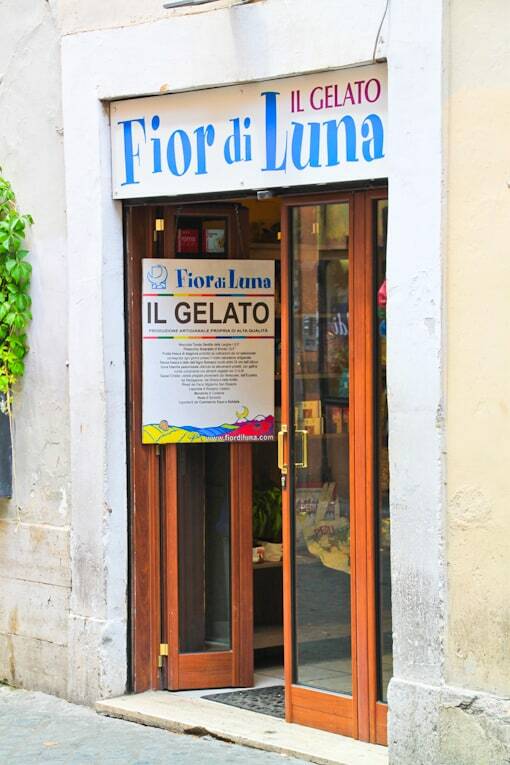 On the way home we stopped at Fior di Luna for some real Gelato. We got the Banana and Custard spiced with Cinnamon and Caramel; and then the Stracciatella and Dark Chocolate gelato. Both with panna on top of course! For dinner, we went to Spirito Divino, an Alice Waters inspired restaurant and part of the Slow Food Movement! 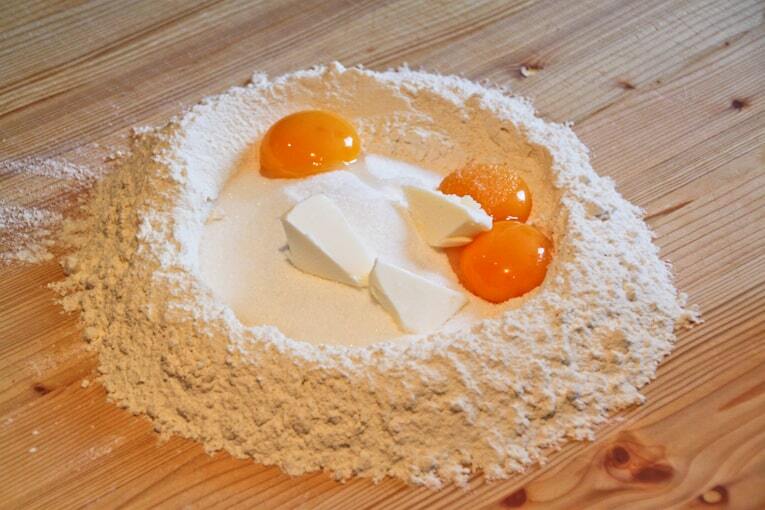 Everything there is made from scratch, is local, and organic. The service is excellent, as is the food. Followed by fresh mozzarella with breadcrumbs and a fresh cherry tomato sauce. 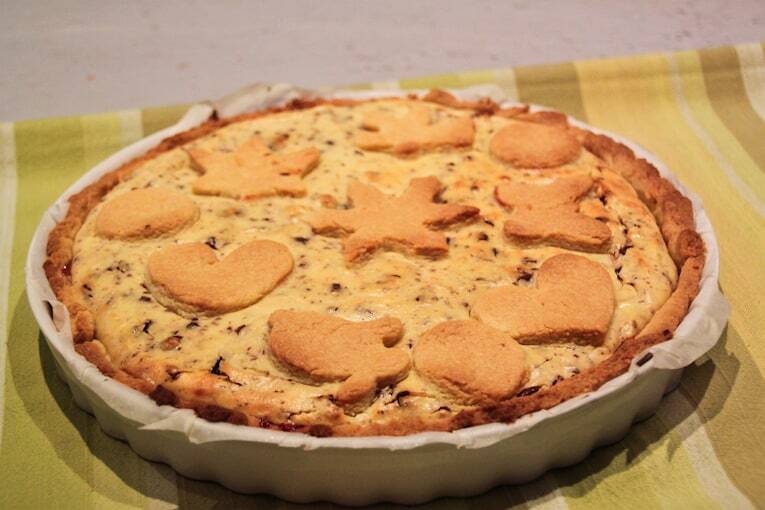 Then a summer vegetables pie – super flavorful, kind of like a quiche but didn’t taste eggy at all. 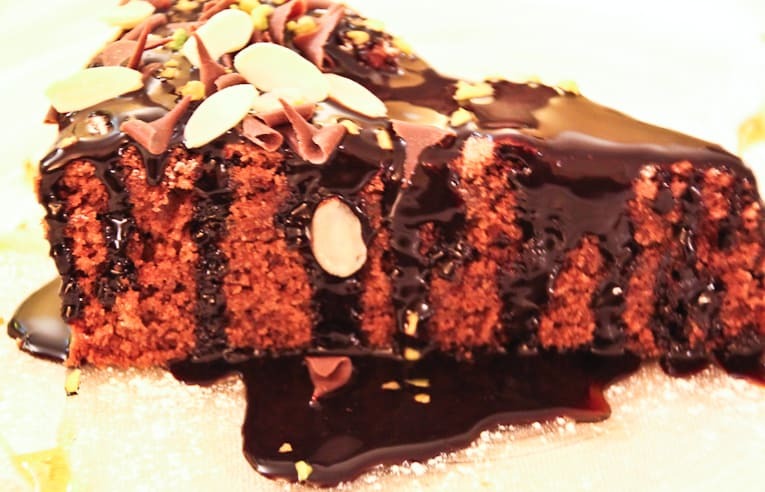 For dessert – Cake made from chocolate and almonds covered with melted chocolate sauce, and English vanilla cream with iced berries, almonds crumble and an orange sauce. 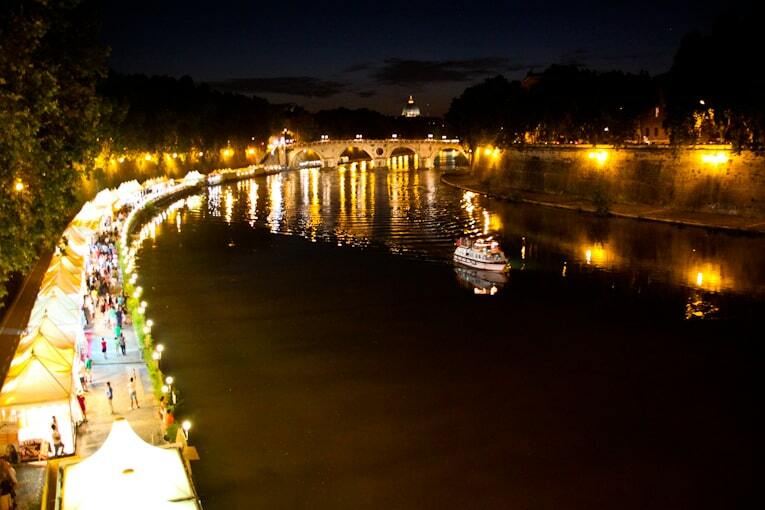 Trastevere at night is definitely the place to be. 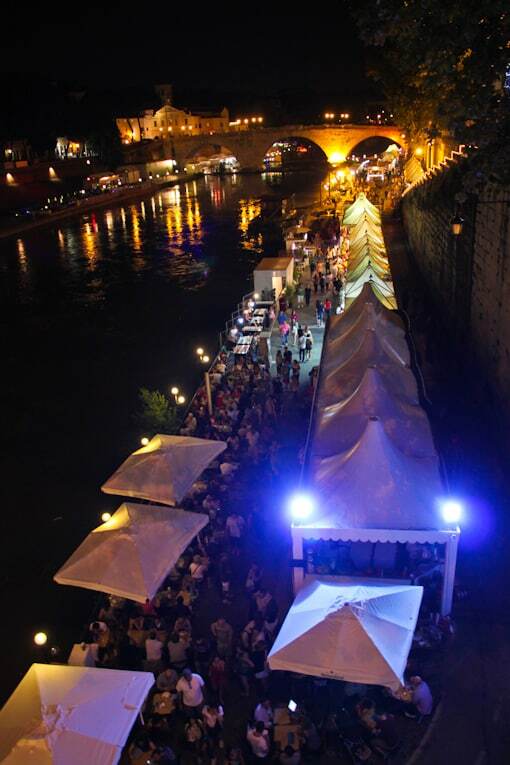 The Tiber River turns into a huge street fair with food, shops and music – running the length of the river. 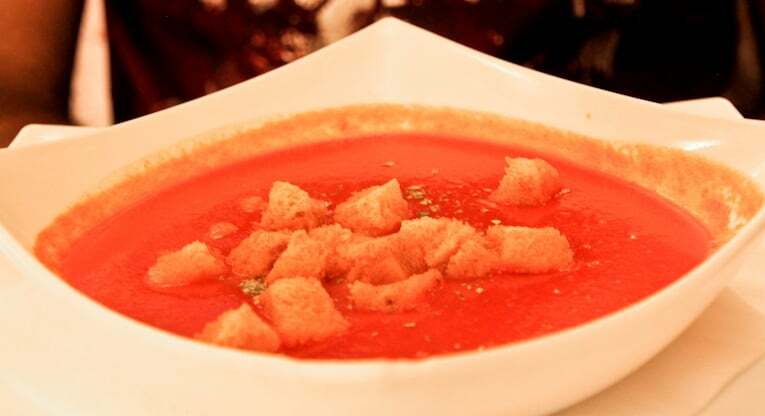 Arancia Blu: Really inventive vegetarian Italian food, tons of veggies, wonderful service. Come hungry though because the food is heavy! 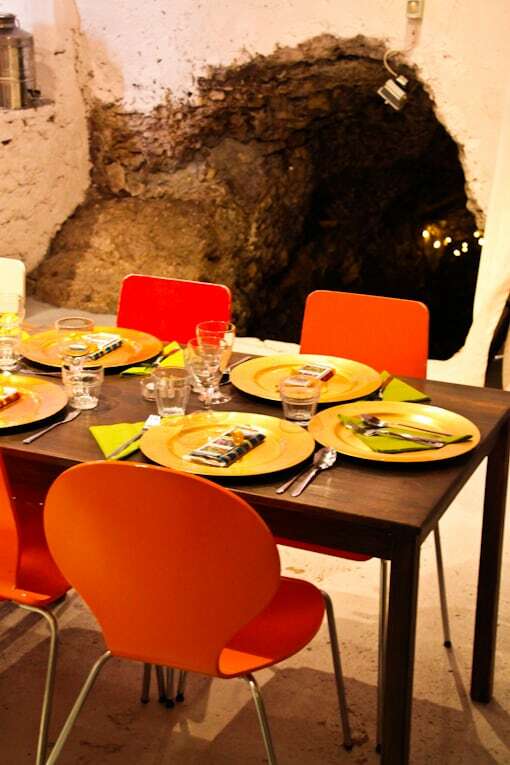 Pinsere Roma: This place is super cute. 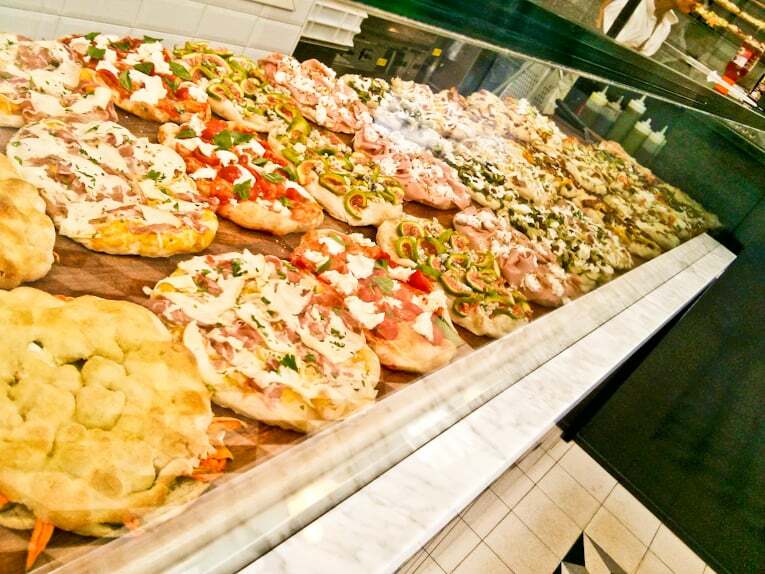 It’s run by all women who make at least 15 different varieties of pizza fresh daily. 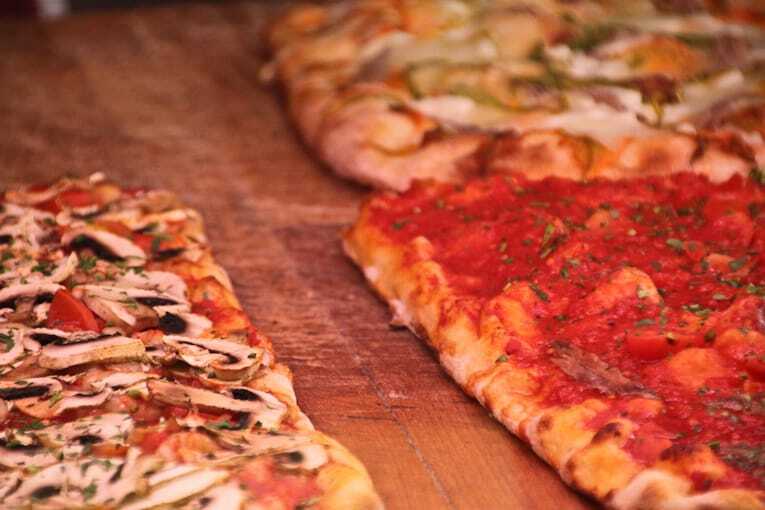 The crust is a thicker crust – more like what you’d find in the US – but the pizza is still tasty and the service is impeccable. Queen Energy: Freshly made juices daily, and an assortment of light/healthy lunch options. 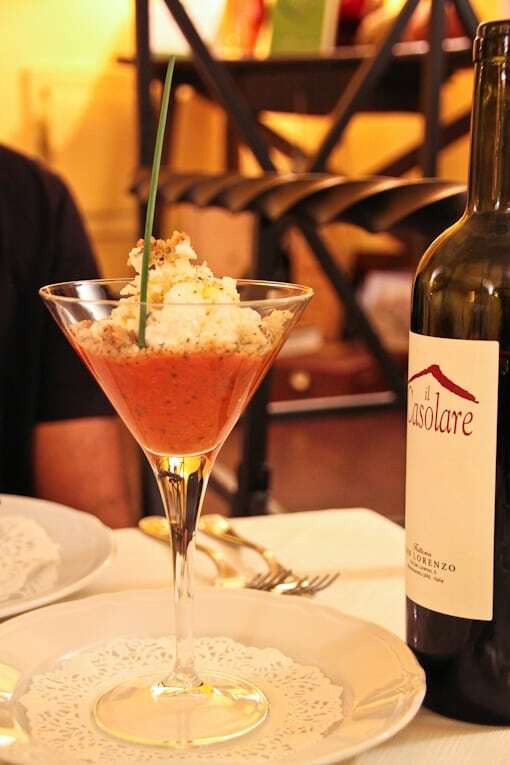 Bibliothe: The one and only Indian restaurant in Rome, serving more Indian-Italian fusion food. We went here twice because their food is delicious. 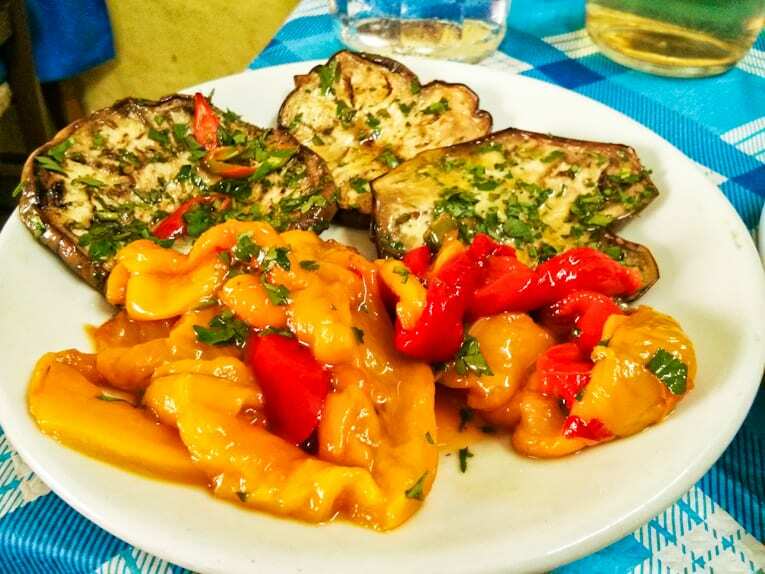 It’s a nice change from the land of pizza and pasta, and their food is healthy and homemade. 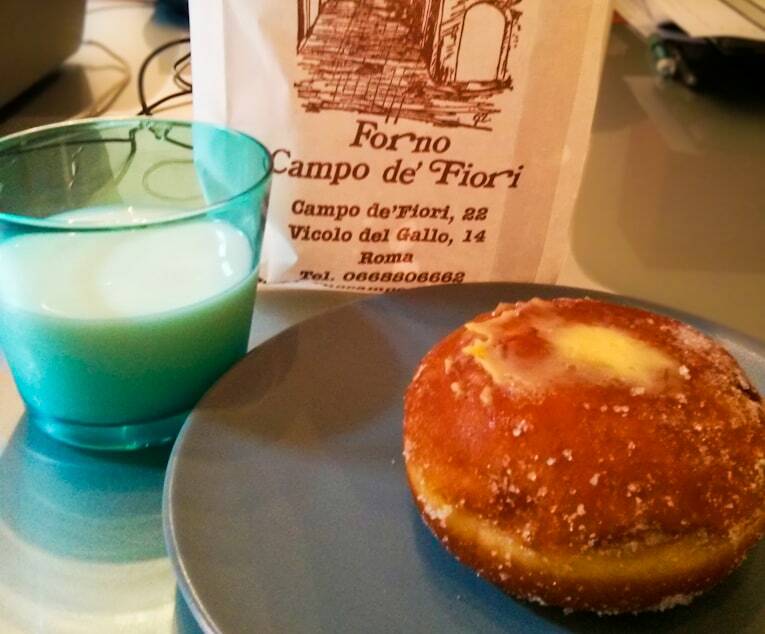 Il Boccione, Via del Portico d’Ottavia 1: This place is in the Jewish Ghetto – and is a traditional Jewish bakery. There is no signage and it looks like a hole in the wall so you really have to search for it to find it. 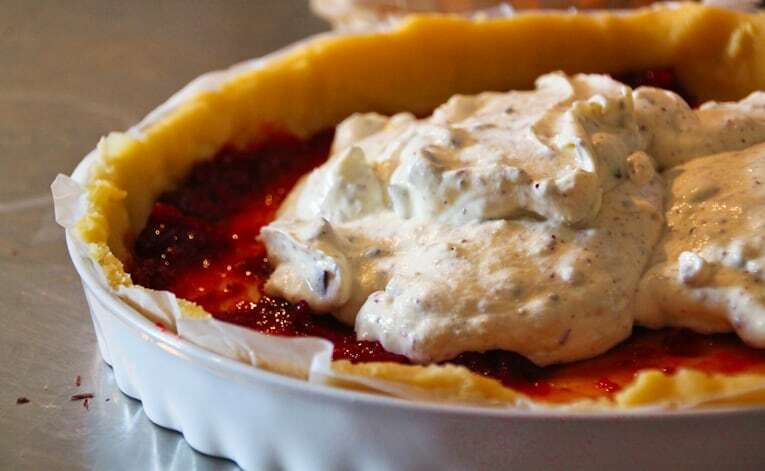 A must try is the ricotta cheesecake with sour cherries – but come early because it sells out by noon! Fonzie – The Burger House, Jewish Ghetto – Made a pretty good chickpea veggie burger with sautéed greens that we enjoyed. The burgers are HUGE though so sharing one is more than enough. 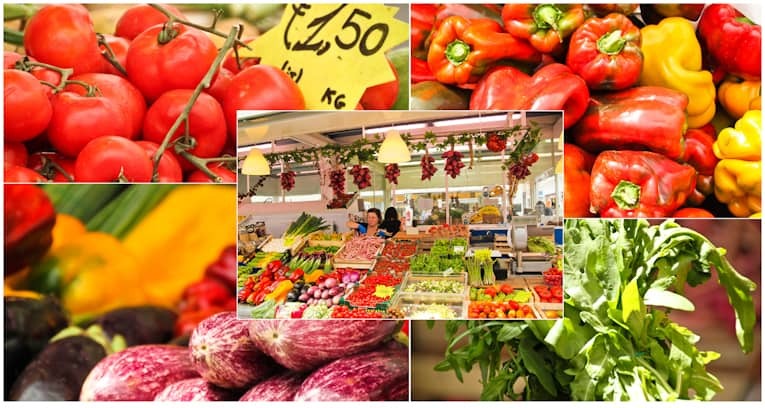 And while I already mentioned these two markets – I spent a good chunk of time buying fresh produce at the Campo de Fiori and Testaccio Markets. It was a great way to balance the heavier Italian food and to incorporate healthy snacks into our day! The food in Rome was definitely a highlight in and of itself. 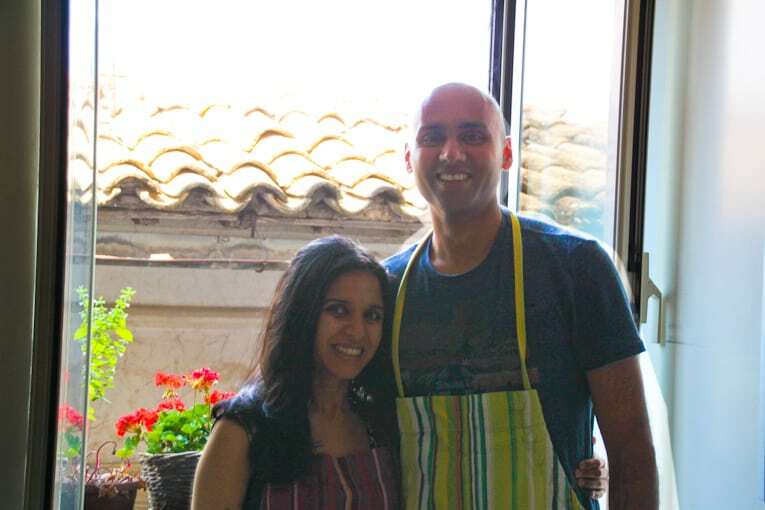 In addition to the food tour that we did, another unique and memorable experience was the day-long cooking class we took through Convivio Rome. 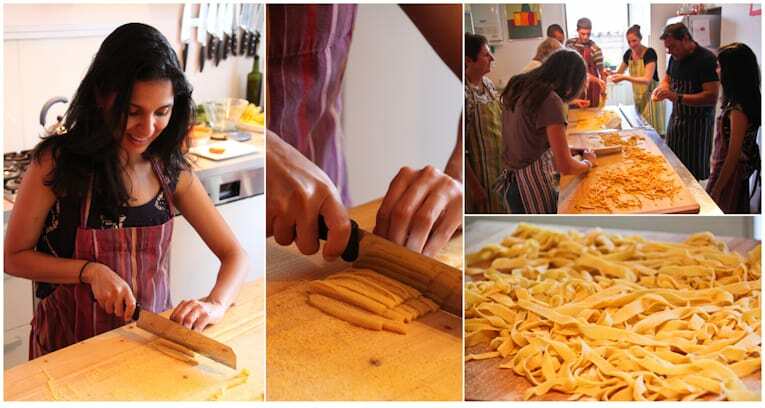 The class was held in a tiny medieval town named Toffia – about an hour outside of Rome. I’m actually going to do a separate post on the cooking class experience, along with the three recipes we made, because trust me – you will want to make these recipes at home. 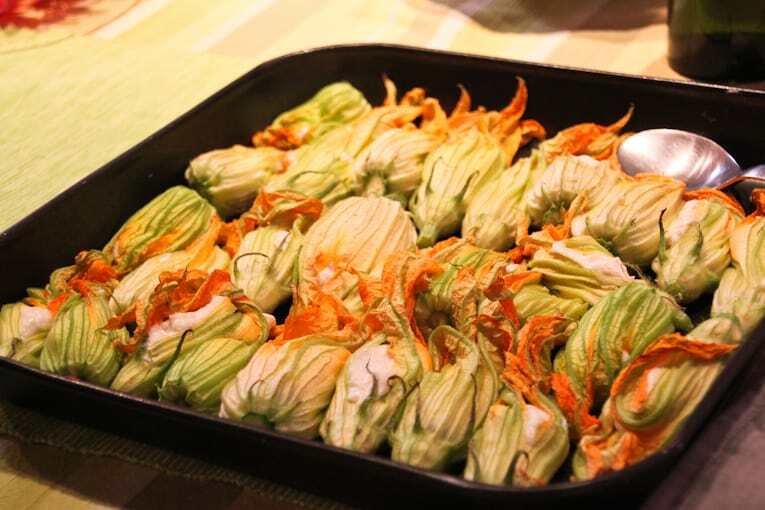 But here is a quick preview: we made fresh pasta from scratch with a homemade tomato and olive sauce, stuffed zucchini flowers with ricotta – baked in the oven, and a dark chocolate ricotta tart. The food sounds simple, but the depth of flavor it had was mind-blowing. We cooked for about 3.5 hours, and ate for about 2 hours. It was blissful. And we were very proud of ourselves when we were done! 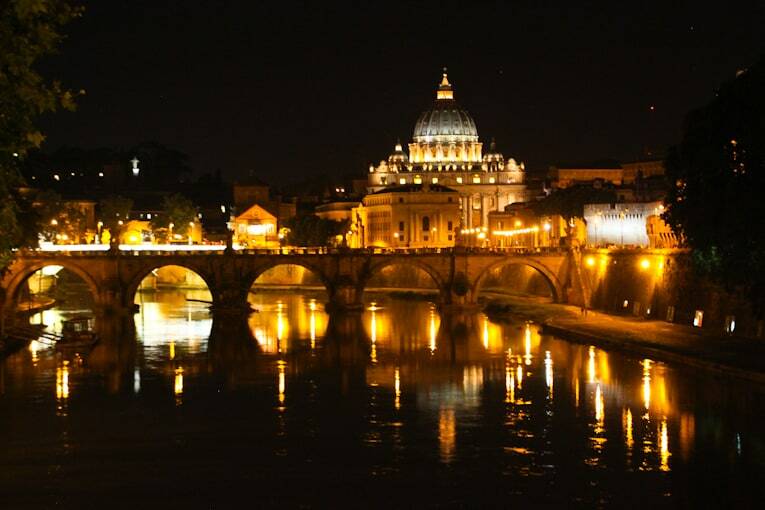 On our last night in Rome, we decided to do a night walk of the entire city. 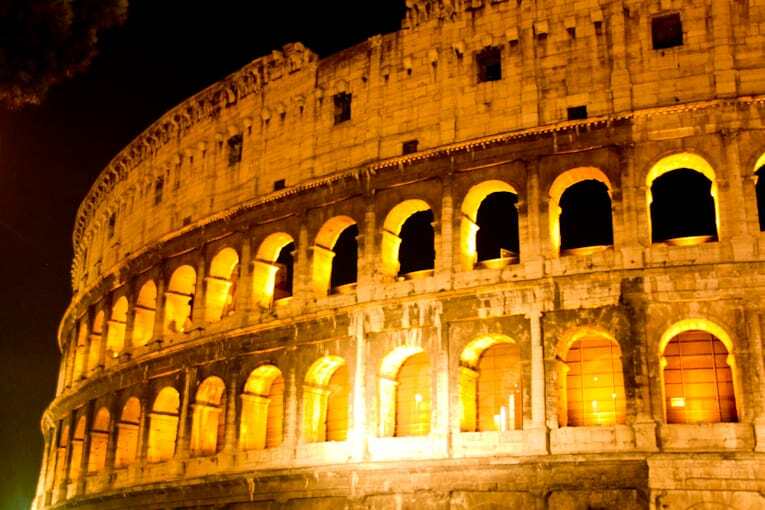 The monuments lit up at night were just gorgeous, the weather was perfectly warm, and as we strolled through the cobblestone streets I realized how much I grew to love Rome in the time we spent there. It was the perfect end to this part of our trip. I never miss Volpetti when I’m in Rome. Such a great selection of cheese. yes!! it was so delicious!! 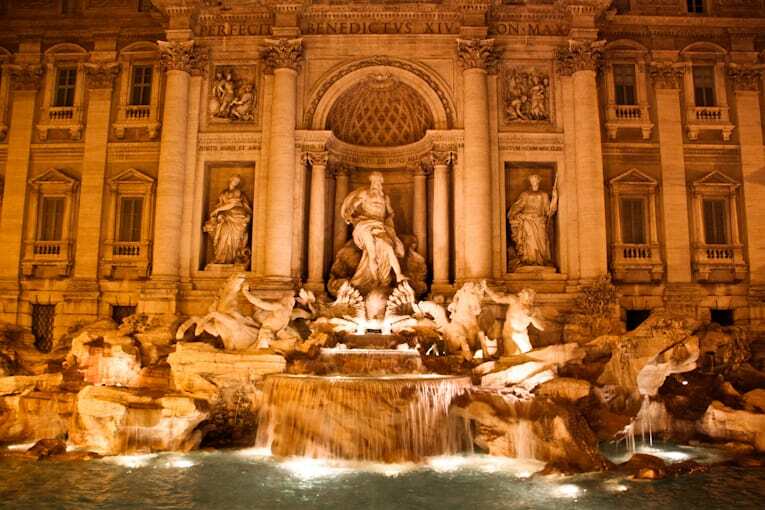 We are planning to visit Rome, Florence and Venice in May. This post is really helpful especially since we’ll be looking for vegetarian options too. Please send me any info and tips you have with regards to Florence and Venice please. Great post. 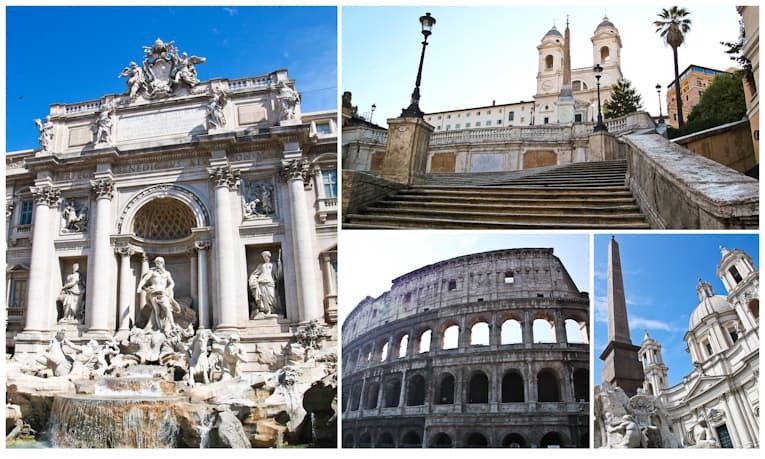 There are so many easily visited places on a Rome trip that it’s hard to decide which one to do. Thanks! Hopefully this post helps you prioritize! Awesome Anjali !! I have to agree – you always have the best pictures! I like it. I eat it. 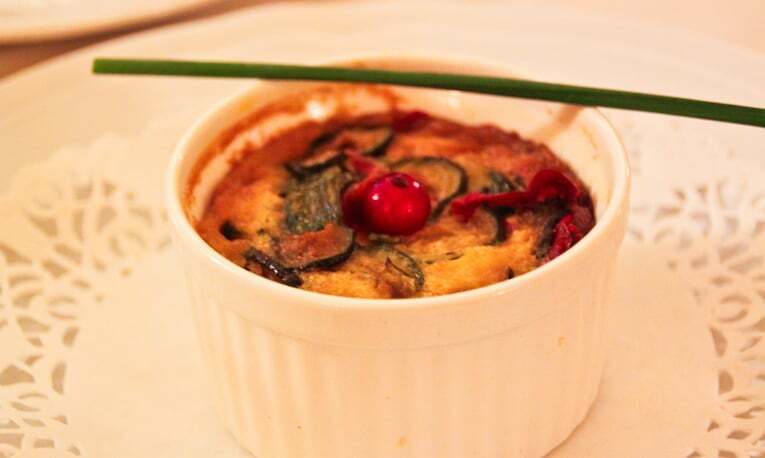 There are very delicious dish. Thanks so much Mohit! Glad you liked this post! Thank you for such an in-depth post. 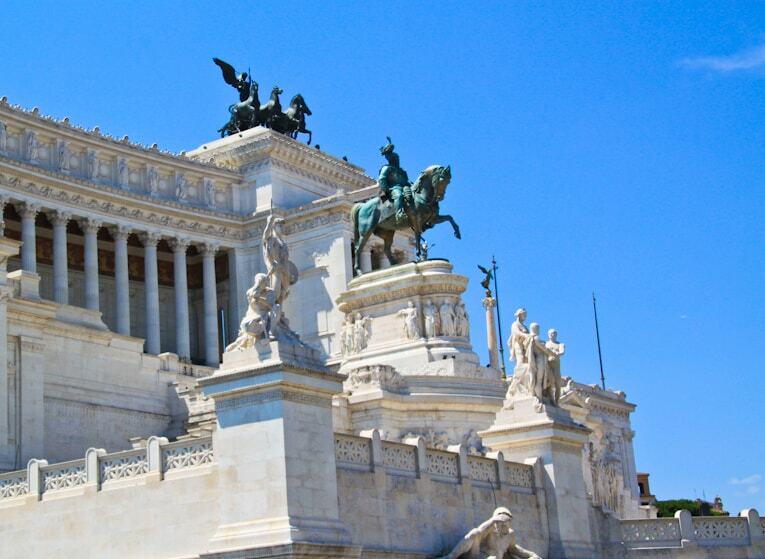 We are going to Rome in August, and I stumbled upon your blog. So many great restaurants are now on our list! Thank you! No problem at all! So glad it was helpful Leeann 🙂 Have an amazing time in Rome!! Hi, we are in Rome for a couple of days in April and your blog is making me regret my short stay! All these restaurants , so little time…! Aww!! But that’s so great you get at least a couple days in Rome! I’d recommend going through this post and picking out the restaurants that look the best to you, and visiting those during your stay. You can always go back to Rome and explore more restaurants later 🙂 The food tour was one of my favorites so if you have a few hours definitely do that. Have a great time!! Great blog on Italy. Wanted to know as to how many days are good enough for cinque terre? And also what town do you recommend staying in? Thanks Ashish! For Cinque Terre, we spent about 3 days there and that was great — hiked between the towns the first day, hung out in the town we stayed in and explored/went to the beach the second day, and then hiked the towns backwards the third day – worked out great! I think we stayed in Monterosso and we loved it! I’m really looking forward to my trip to Italy in May, will be keeping this page for reference. I do have a question about the cannoli. I’ve heard the crust is made with lard, where the ones you ate vegetarian? I hope they are, I love cannolis. Oh that’s so wonderful that you’re going to Italy in May! You will have an amazing time. 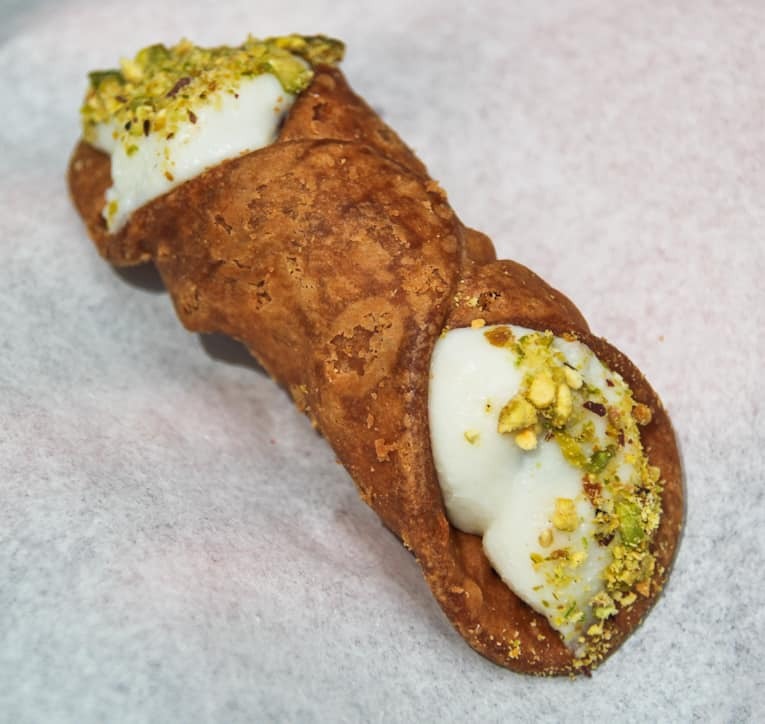 Regarding the cannoli, we tasted the ones at the Testaccio market as part of a tour — and we had requested that everything for us was vegetarian (so I’m assuming those particular cannolis were too). But it’s always worth asking when you go – I’m sure you will be able to find some vegetarian friendly ones! i’m just planning a trip to Rome and Tuscanyfor the end of December/Jan and I stumbled onto your blog–it’s fabulous and I’m definitely piggybacking on some of your finds (the bakeries sound particularly amazing and all your tips on good veggie food is particularly relevant.) Can you share the name of the apartment that you rented and would you recommend it? thanks! Thanks Situ! 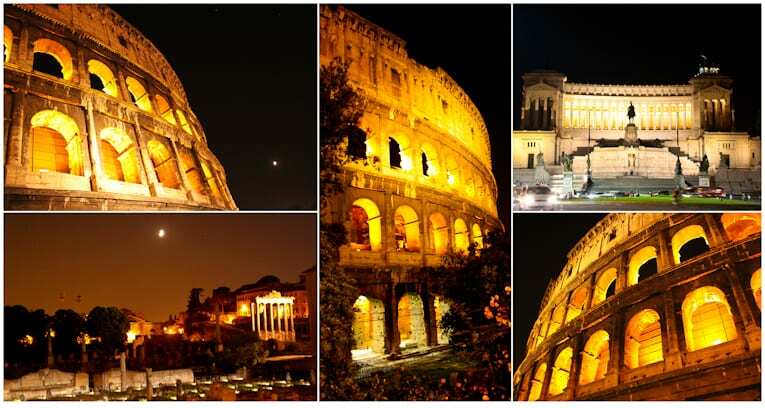 And yay – I’m so excited for your trip to Rome & Tuscany! 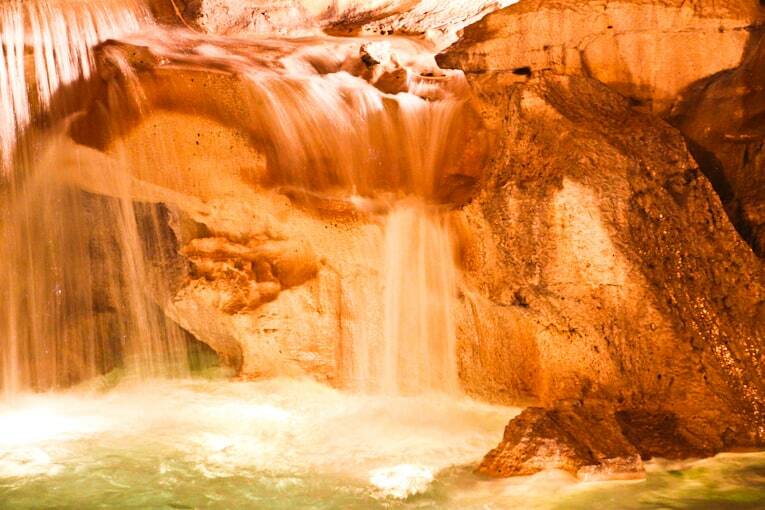 We used Sleep In Italy to find our apartment – which was called the “Trevi Rainbow” in Rome. I’d highly recommend it – super organized landlord, affordable, great location, enough space. Hope that helps, and hope you have an amazing time!! Thank you so much for your wonderful tips! No problem at all! Glad it’s helpful!